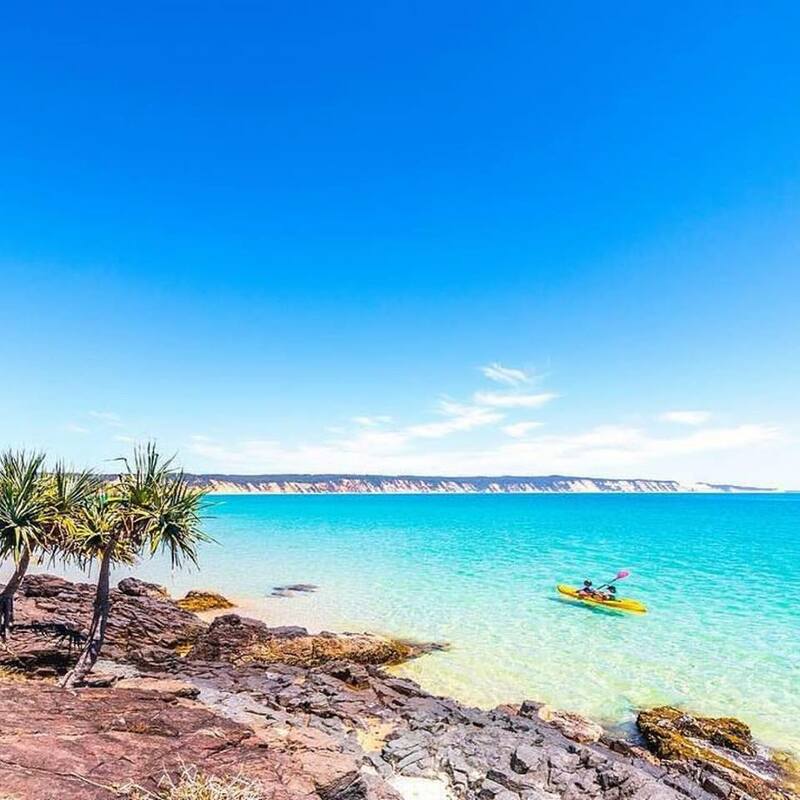 Take the ultimate private National Park aquatic adventure to Sunshine Coast's hidden tropical paradise at Rainbow Beach's iconic Double Island Point. 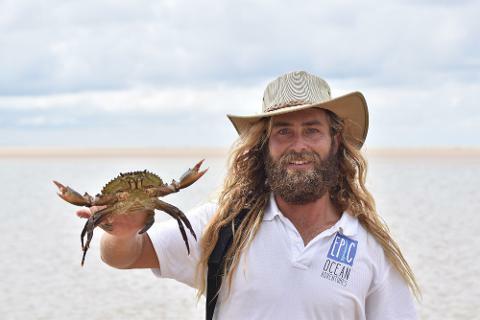 This spectacular Marine Park is only accessed at low tide with our specilised 4X4 and due to it's remoteness is home to many local and migrating wildlife throughout the year. Spend the day with family and friends and learn about one of the most diverse National Parks in the world with our fun local guides passionate about their roles in the conservation and sustainability of such an important wildlife refuge and Eco system. An amazing way to experience the Marine Park on a surf, stand up paddle and sea kayaking adventure. Experience a unique private Marine Park aquatic adventure > 4X4 beach access only around low tide. Personal experienced local tour guide > Learn about history, flora & fauna of the area. 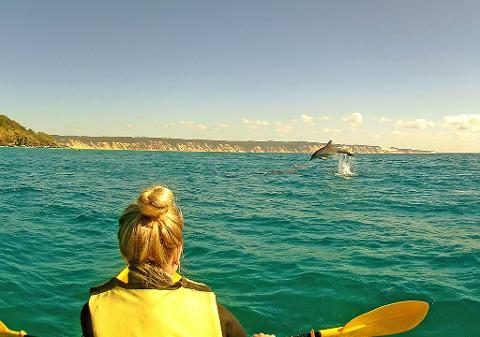 Choose your aquatic activity’s for the day in the spectacular Marine Park > Surfing, Dolphin View Sea Kayaking, Stand Up Paddling. 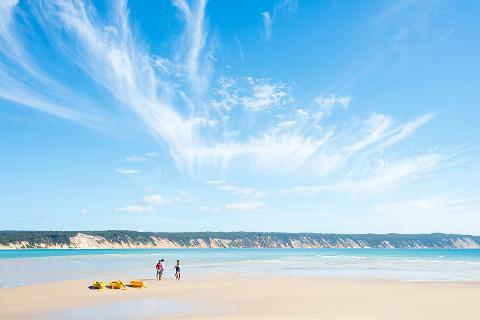 Immerse yourself in the area's iconic natural features including Rainbow Beach Coloured Sands, Honeymoon Bay & Fraser Island views. 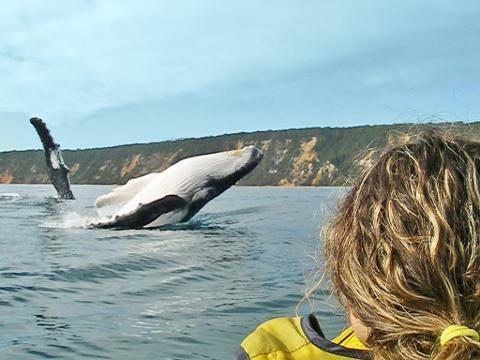 Lifetime experience > see Australian & migrating wildlife in their habitat, in the wild. 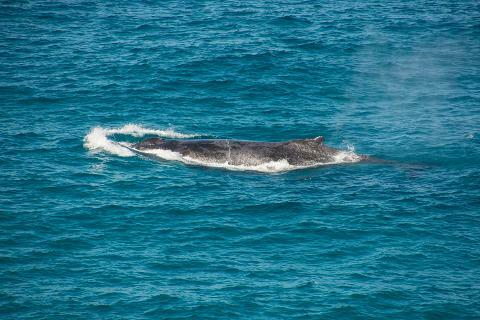 Large pods of dolphins, whales (35,000 passing each way this year on migration), turtles, rays, migrating birds, soldier crabs in their thousands are all frequent. Beginner friendly equipment & location, no experience needed and an ideal family adventure environment. 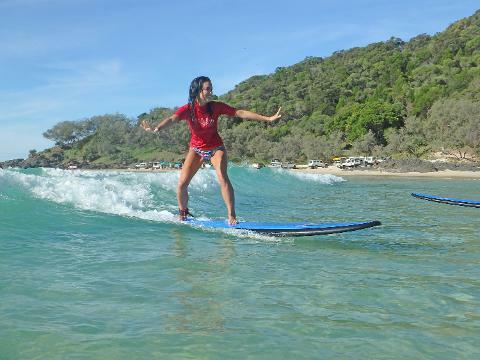 Exclusive Double Island Point surfing, kayaking & stand up paddling aquatic operator. Departure: Pick up from Noosa accommodation. Please allow 6 hours from pick up to drop off. Please be aware this unique private tour departures daily and times vary due to tide times to access Double Island Point along the beach. 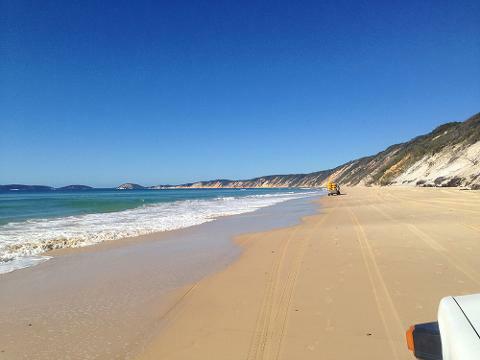 Depart Noosa in private specialised 4X4 vehicle. 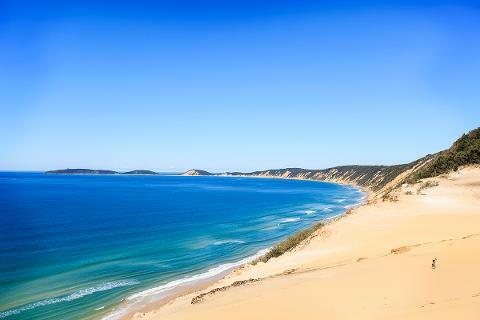 Experience the thrill of the Great Beach Drive along Teewah Beach that stretches over 50km's to Double Island Point. Take in the stunning wind swept Coloured Sand cliffs towering over the beach & many different types local flora & fauna. Arrive at the aquatic Marine Park paradise, Double Island Point. Breathtaking remote National Park beaches > an amazing sense of freedom. 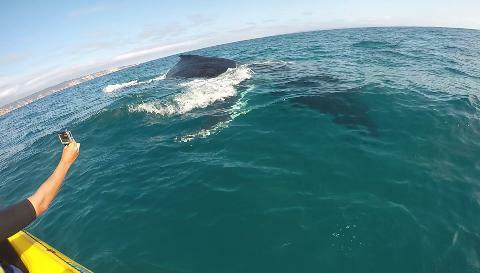 Spectacular headland buzzing with marine life in the wild. Enjoy the turquoise waters of Honeymoon Bay with the aquatic activity of your choice. 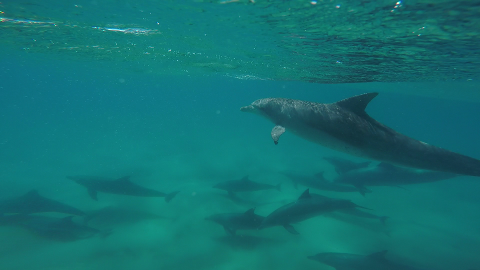 See local Bottlenose dolphins feeding and playing up close in the Marine Park. Spot the different types of turtles and rays in the crystal clear waters in the protected Marine Park. 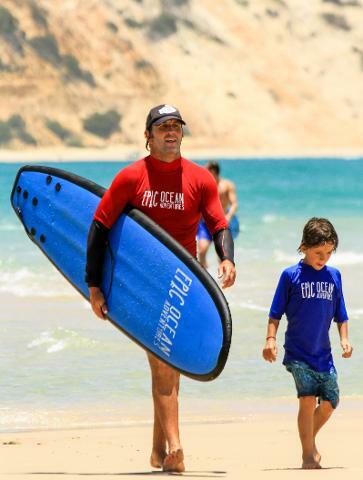 Feel the thrill of surfing on Australia's longest wave with waves for 100's of meters and for all abilities and ages. 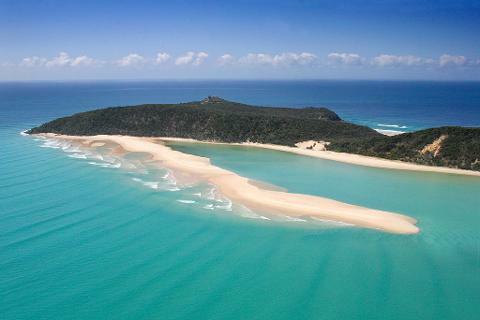 Tasty picnic lunch & refreshments whilst viewing the stunning back drop of Fraser Island and Rainbow Beach cliffs. 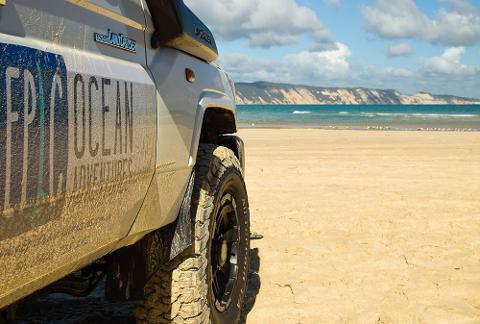 What's included: 4X4 Great Beach Drive experience, guided tour and/or instruction by local experienced guide, specilised equipment, Rainbow Beach Coloured Sands, picnic lunch & refreshments, National Park entry fees, ferry fees,pick up & drop off from accommodation. PLEASE NOTE: MINIMUM OF 4 TO BOOK THIS TOUR IF YOU ARE LOOKING FOR PRIVATE TOURS FOR COUPLES PLEASE CONTACT US.